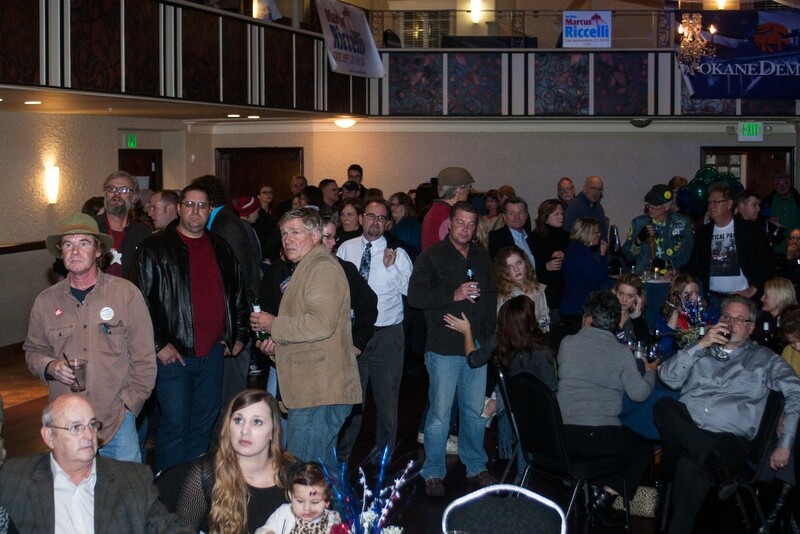 With a midterm congressional election and numerous state and local elections, the Democrats and Republicans each held election results parties to gather together candidates and supporters. 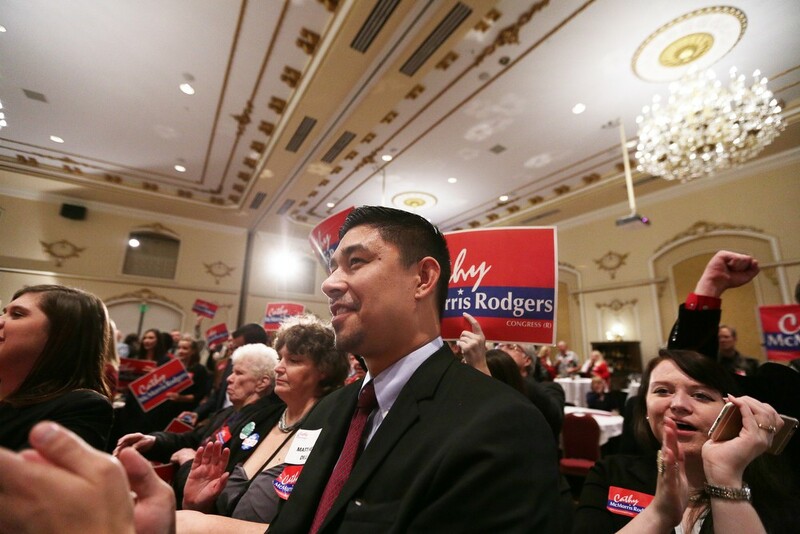 We sent photo intern Ashley Tomlinson to the Lincoln Center to cover the Democrats and staff photographer Young Kwak to the Davenport Hotel to cover the Republicans. 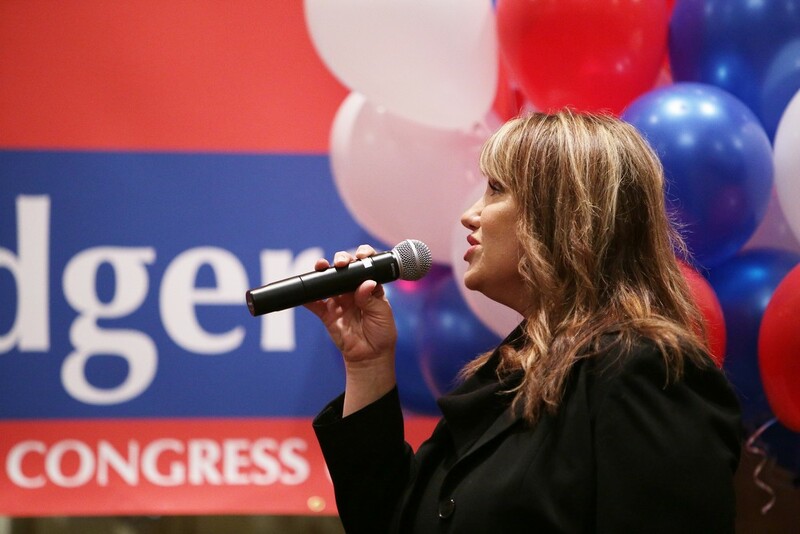 Lisa Frandsen sings the national anthem. 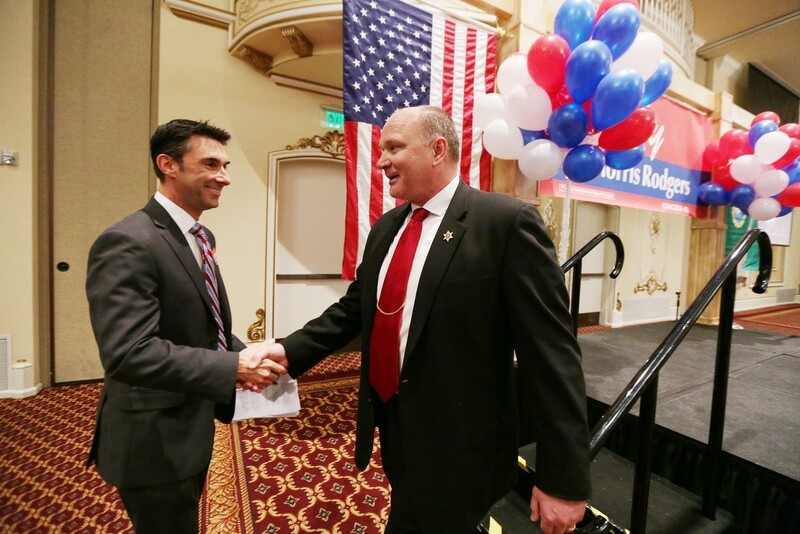 After speaking, Spokane County Sheriff Ozzie Knezovich (R), right, shakes hands with Legislative District 6 State Rep. Kevin Parker (R). 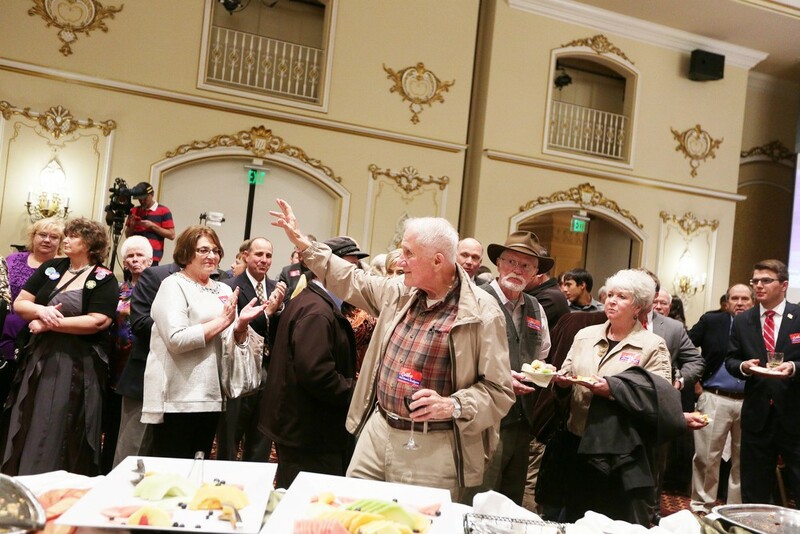 Former Washington State Republican Legislative District 6 State Representative John Ahern greets attendees. 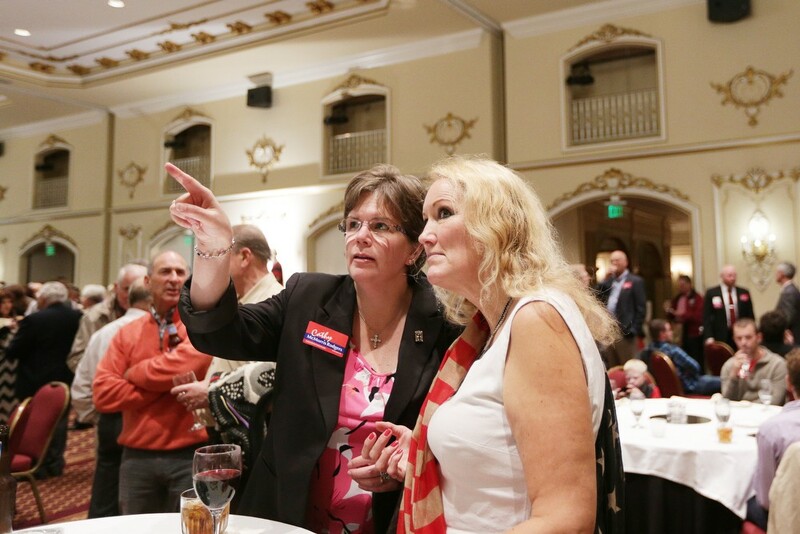 Spokane County Prosecuting Attorney candidate Larry Haskell (R), center, speaks with Anita Macklin, left, and Spokane County Clerk Tim Fitzgerald (R). 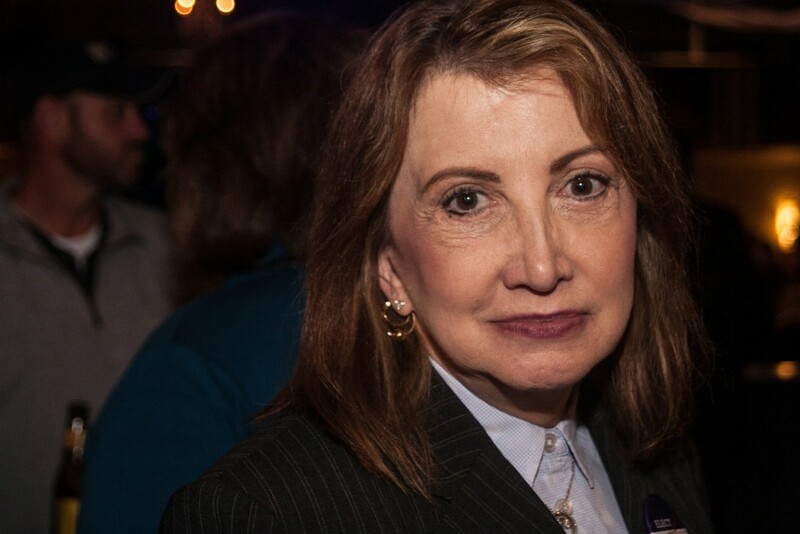 LeAnn Grant, left, and Helena Griswold monitor election results. 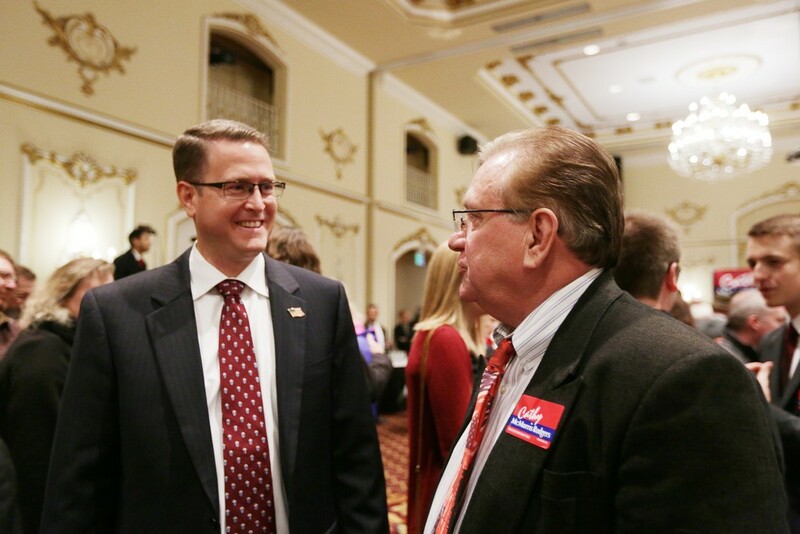 Washington state Rep. Matt Shea (R), left, and Spokane County Republican Party Chair Dave Moore speak. 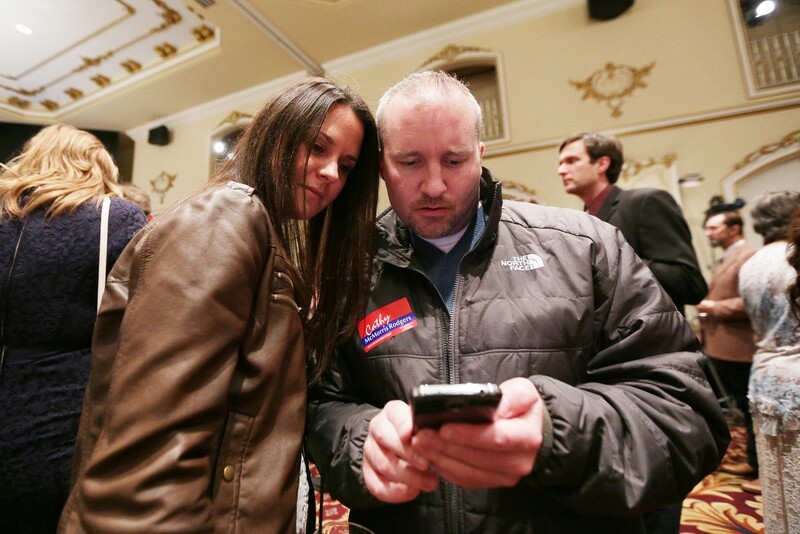 Jodey Miller, left, and her fiancé Michael Cannon monitor election results. 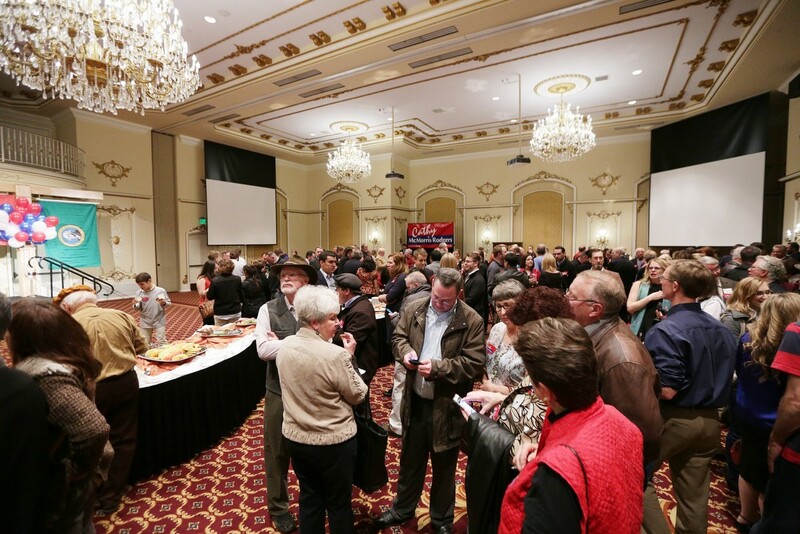 Attendees wait for election results. 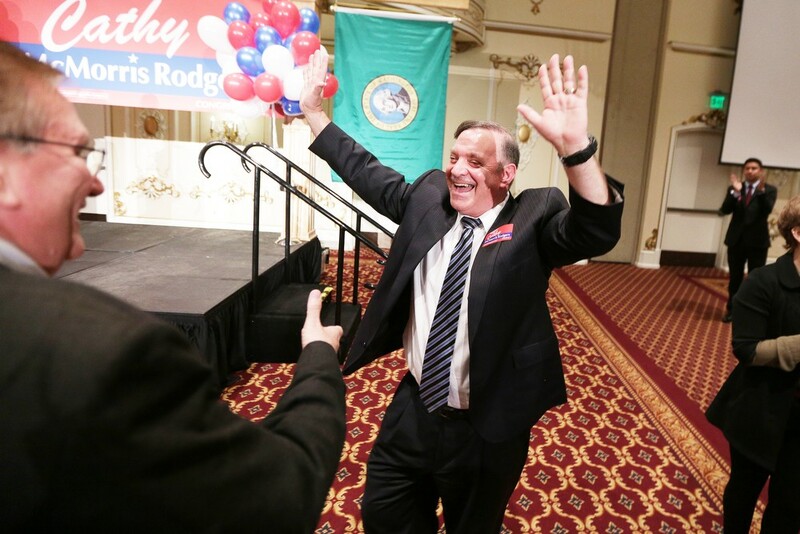 After the first election results show him with a 17 point lead over his rival Breean Beggs (D), not pictured, Spokane County Prosecuting Attorney candidate Larry Haskell (R), right, celebrates with Spokane County Republican Party Chair Dave Moore. 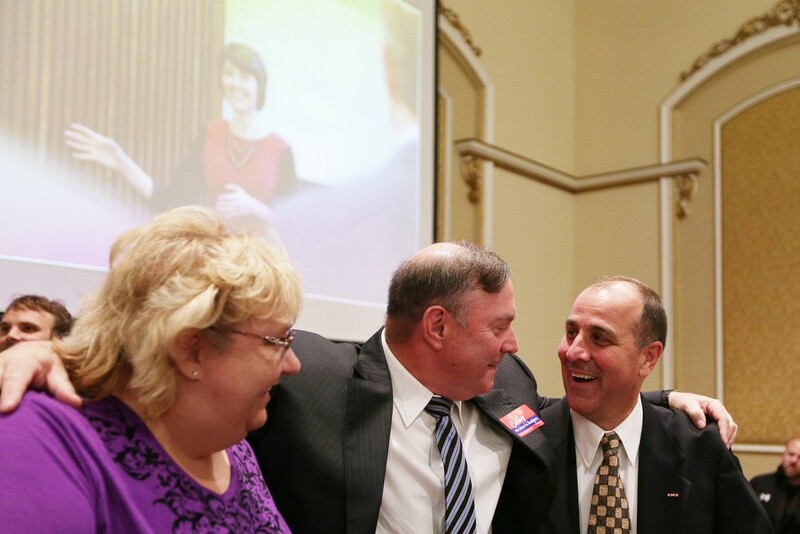 After first election results Spokane County Clerk Timothy Fitzgerald (R), left, hugs Tracy Pendarvis. 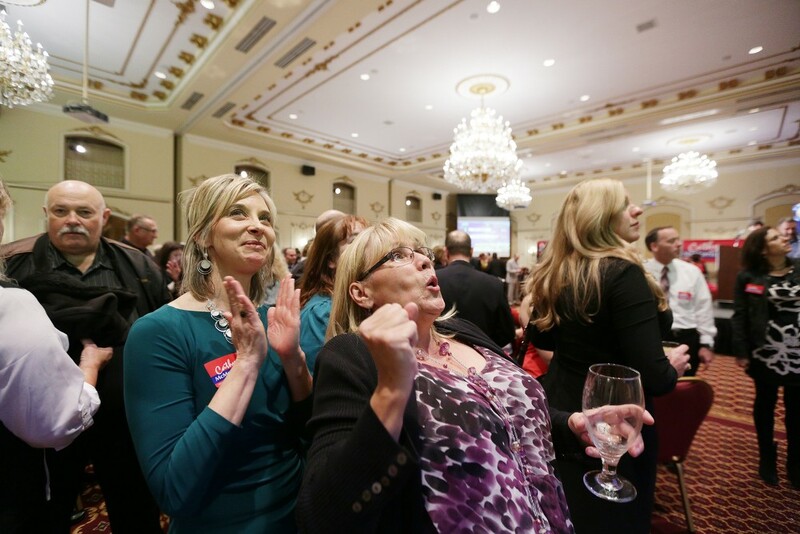 Peg Prouty, center, and Tracy Pendarvis cheer as election results are posted. 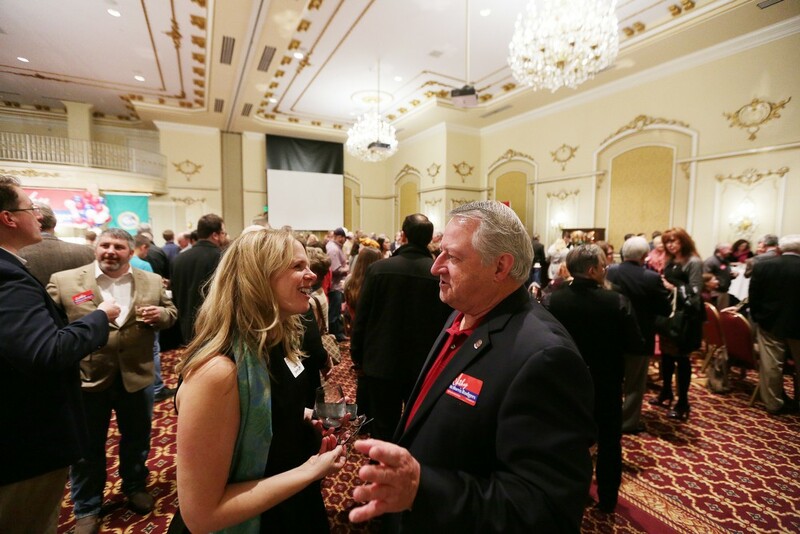 Julie Shiflett, left, speaks with Spokane County Commissioner Al French (R). 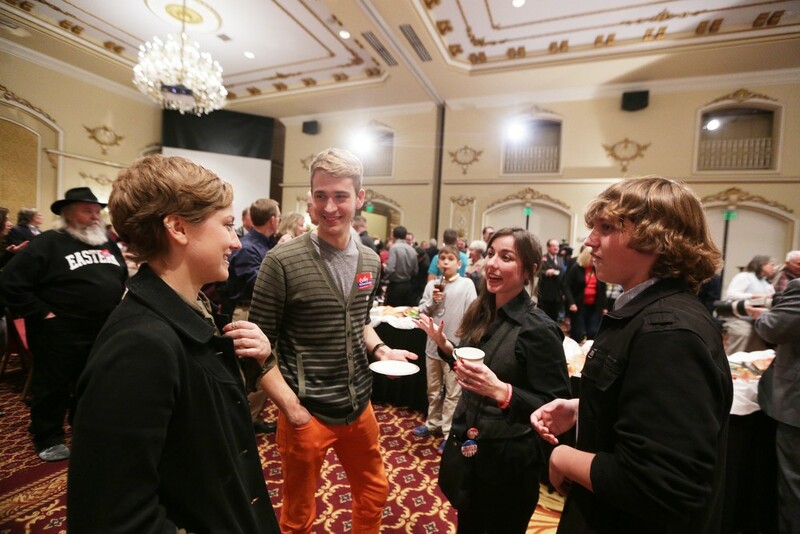 The children of Spokane County Clerk Timothy Fitzgerald (R), not pictured, Erin Fitzgerald, left, Meghan Fitzgerald, second from the right, 15 year old Kellen Fitzgerald, right, speak with Scott Mackay. 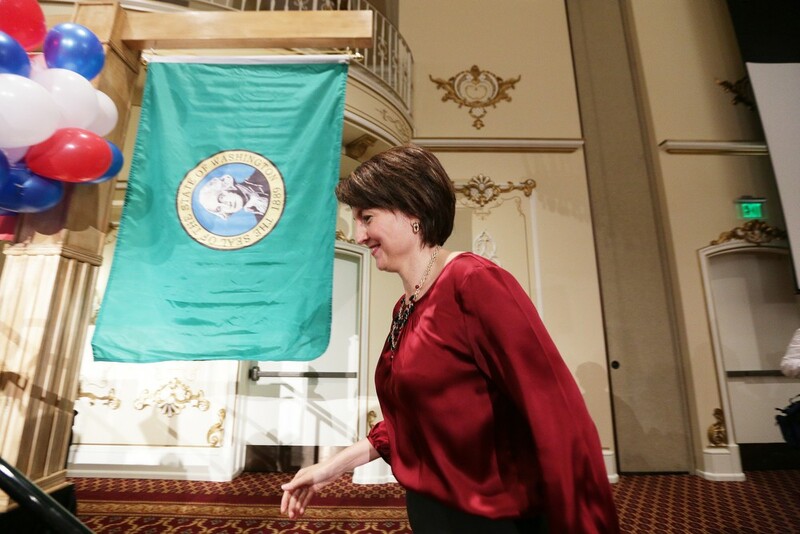 Thomas Jarrad, right, takes a photo of his 11 year old son Joe, bottom, and U.S. Rep. Cathy McMorris Rodgers (R). 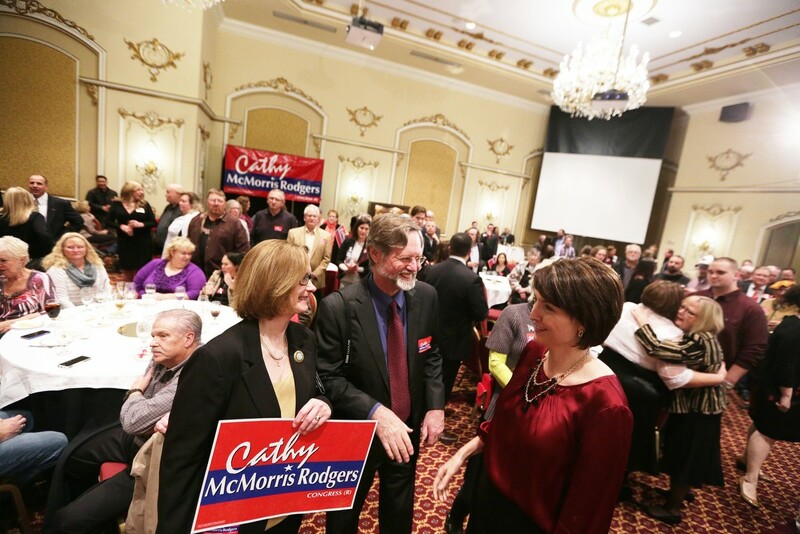 U.S. Rep. Cathy McMorris Rodgers (R), right, speaks with Ken Issacs, center, and his wife Julie. 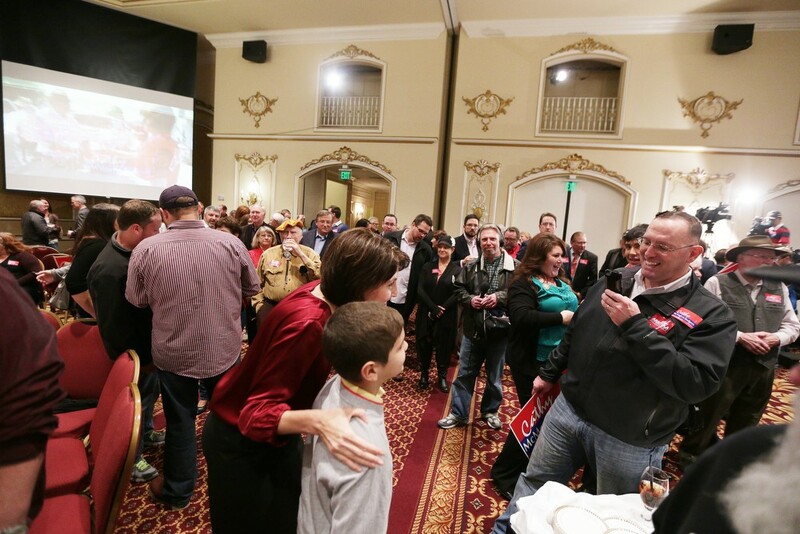 U.S. Rep. Cathy McMorris Rodgers (R) greets supporters. 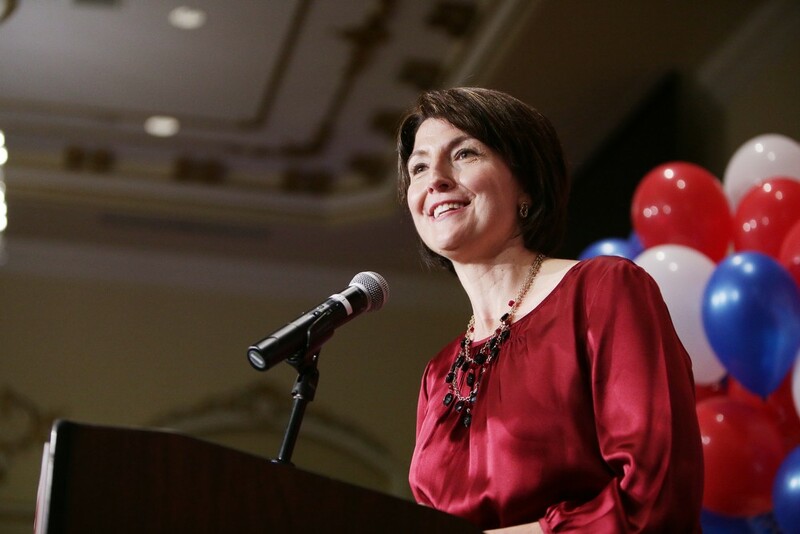 Cathy McMorris Rodgers (R) walks to the stage to speak. 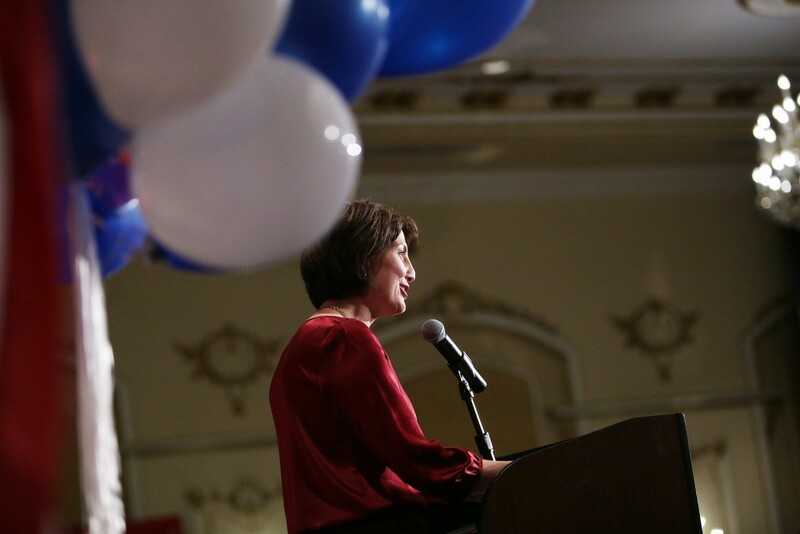 U.S. Rep. Cathy McMorris Rodgers (R) speaks. 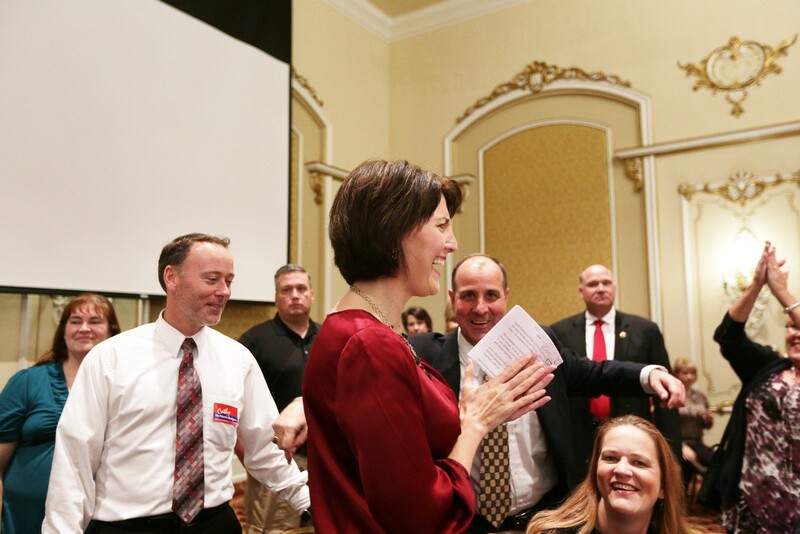 Matthew Dill, center, applauds as U.S. Rep. Cathy McMorris Rodgers (R) speaks. 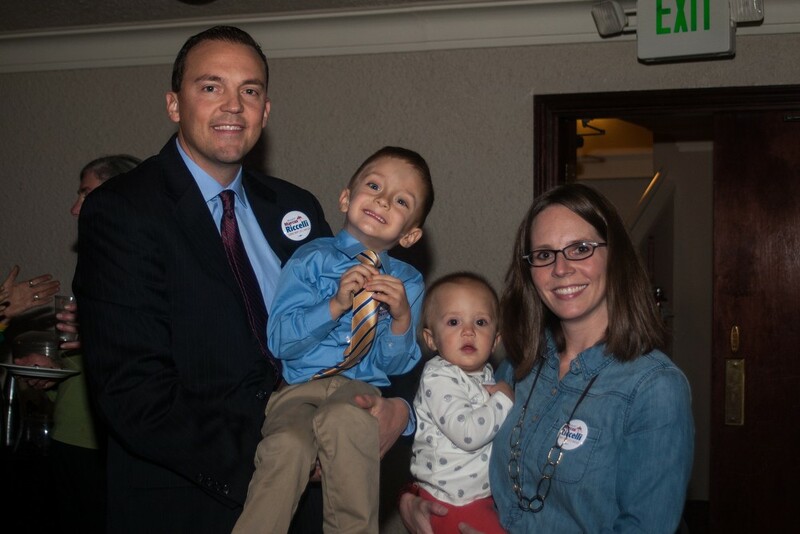 State Rep. Marcus Riccelli (D), left, poses for a photograph with (left to right) his sons Brayden, Bryn and wife Amanda. 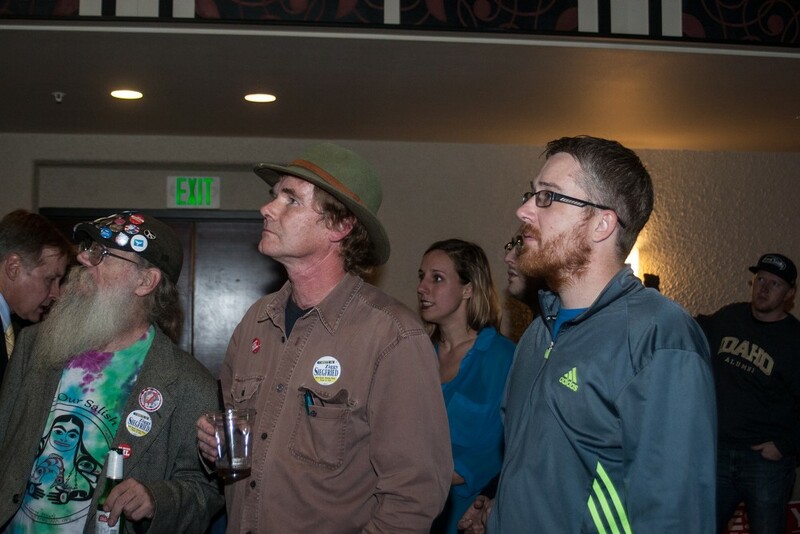 District 6 State Representative candidate Ziggy Siegfried (D), center, watches as the first election results are posted. 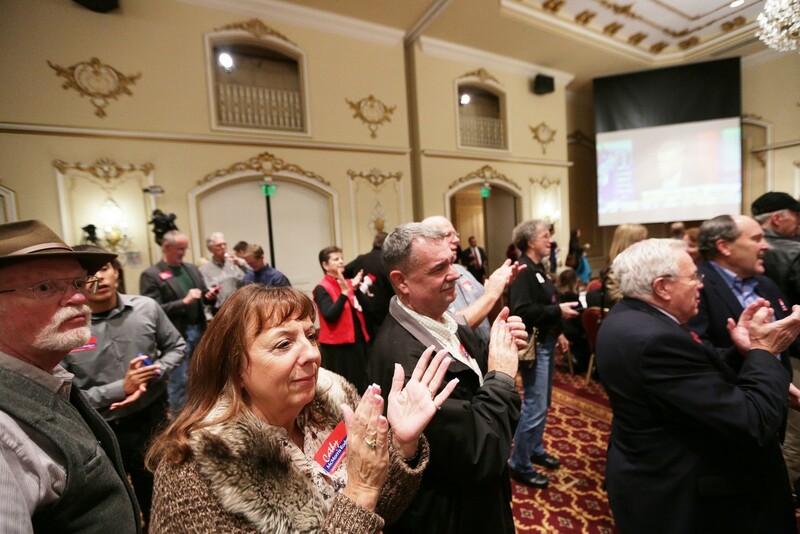 Supporters of Democratic candidates watch as the first election results are posted. 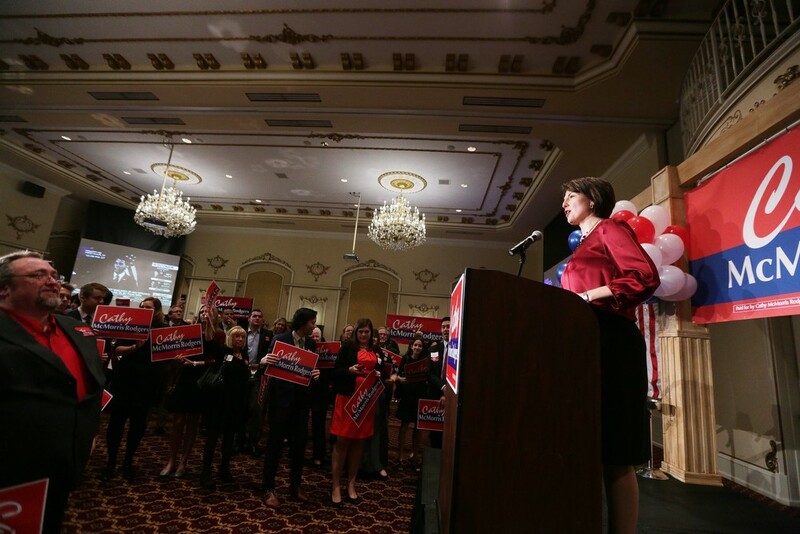 Spokane County Treasurer candidate Amy Biviano (D) speaks to supporters. 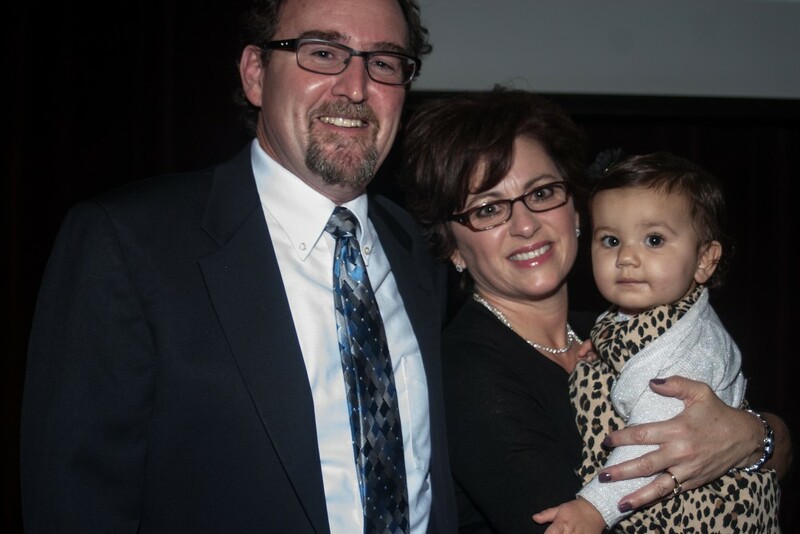 Spokane County District Court Judge 8 candidate Tim Trageser, left, poses for a photograph with his wife Tracy Trageser and thier granddaughter Aria. 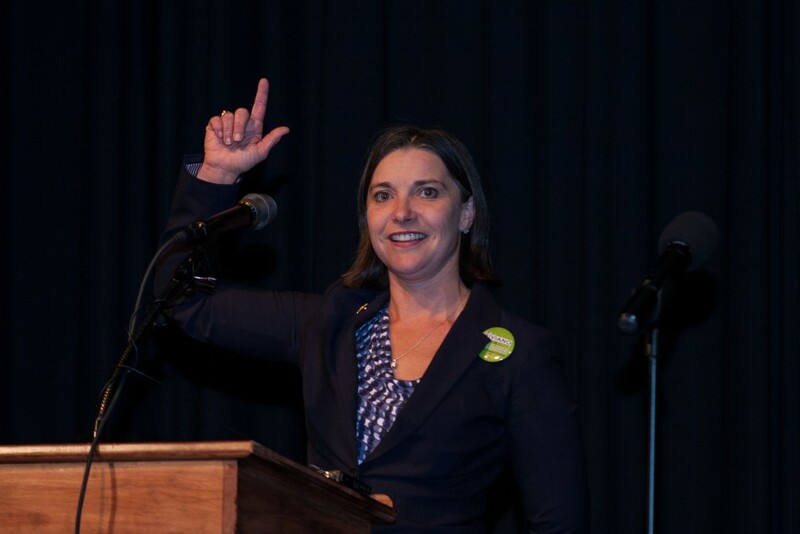 Spokane County Clerk candidate Mary Wissink (D) stands for a photograph. MORNING BRIEFING: Elections! Indictments! Cumberbatch!